When I was five years old, my Granny and Granddad went to America to attend the wedding of their youngest daughter. I think they went for a full three weeks and the photographs that came back were extraordinary. Granddad, a flat capped stevedore all of his life, was seen all-decked-out in a gleaming white tuxedo with pale blue collar trim. They arrived back with gifts for my two older brothers and me. I believe that I remember these gifts very clearly, although I may be wrong. As I recall, my eldest brother got a cassette tape recorder, one of those ones that came in a black leatherette case and had one little control that you pressed back to rewind, forward to fast-forward and upwards (click) to play. My next–oldest brother got a Polaroid Camera. Apparently, I was the cause of some consternation. These were top end presents and everybody was quite at a loss as to what could be got for me. The story goes that my new uncle, a wonderful man in every way, came in from work on the evening before the journey home to Ireland and placed a box on the table saying, “This is for Kenneth”. It was a watch. 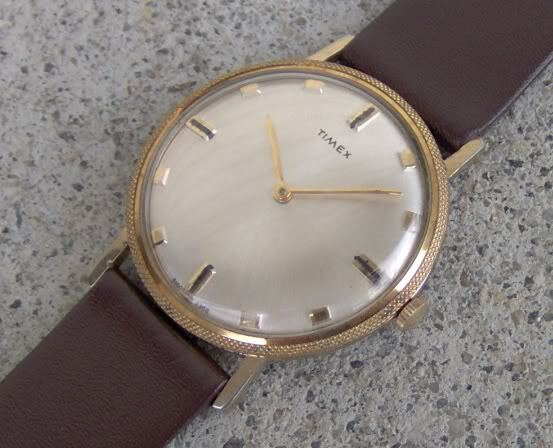 A gold Timex watch. For me. The was a special aura about that watch. It was presented with a sense of awe, almost as if it was far too valuable a present for such a small boy. That was probably part of the show, a ploy to stop me from being too jealous of my elder brothers’ bounty. I would never have been jealous. I had my watch, my gold watch. Photographs of me from the subsequent years almost always featured the watch prominently, in much the same way that a film about a relationship will often tend to show the wedding rings clearly. I loved that watch, wore it for a full decade after I got it, and never quite got over the thrill of such a serious grown-up gift for such a small fellow. Suppose I was kidnapped by Martians tomorrow and they put me in one of their advanced machines to extrapolate my memories in order to recreate, in physical form, the things I remember. Suppose they tried to recreate my gold watch which I wore and consulted for so many years. The truth is, they wouldn’t get very much. My memories are very much related to how I felt about that watch rather than what it actually was. The Martian Dream Machine would probably create a warm cloud of fuzziness with a golden hue and little more. Now, suppose they further tapped my memories and found that other thing that my Granny and Granddad brought back from America when I was five years old. Supposing they were to recreate that. It would drop, fully realised into the dream item dispenser and it would be quite, quite perfect. I had never seen anything like them before. Before they arrived, we had chocolate and penny chews and lollipops and sticks of rock but there had never been a smooth, crunchy, Technicolor treat such as this. The Peanut M&M, circa 1968. Granny and Granddad brought huge hoards of them back from the States and they kept them in the sideboard cupboard tucked away behind the delph plates and bowls. Every Sunday Visit was an unbearable wait for the little bags to be brought out and distributed. They were, in one word, Treasure. The more senses a thing assails, the better I remember it. There was a particular smell to the seaside bus on a Summer’s day, just as you climbed aboard. Now and again, I catch a hint of that smell, a hint of trapped sunlight and dull air, and I am rushed back to those huge sandy-ridden steps up to the bus driver. M&Ms came when I was five and assailed all of my senses at once. Visually, the three base colours - yellow red and green. Aurally, the crunch. Taste, obvious. Touch, the smoothness of the product, the sophistication and other-worldliness of the packaging. Smell, a chocolatey hint, released as soon as the bag was opened. It’s for this reason that M&Ms remain special to me. I had a crafty packet only yesterday and that’s why I’m writing this now. The effect of biting into the first was a little like Peter O’Toole’s food critic in the Pixar Film when he places a forkful of Ratatouille into his mouth and is immediately transported to a simpler time, far far away. The truth is, there isn’t. There just isn’t. I was never a fan of M&M’s. They were Americanised Smarties. And the peanut ones were Americanised Treets. I don’t think I’ve ever bought a packet in my life. I have tasted them and was unimpressed. I was unimpressed even before I tasted them. There was no way I was going to be won over. When Carrie and I went to America one of the things I was looking forward to was all the new sweets and I have to say—ice cream sandwiches excepted (loved them! )—they were a big let-down. Nothing can live up to a kid’s imagination and even now I still have a kid’s imagination. I do remember my first watch. I remember being taken to a local jewellers and getting to pick a watch, not that the selection was huge. It was nowhere near as grand as your gold watch. But it was a Timex. I thought the company had folded but it seems not. I’ve never really thought of myself as a brand person but I have to say if my wife bought me a new watch for Christmas—not that I have any need of one—I’d be extra pleased if it was a Timex. Odd that five wee letters could make such a difference. I’m the same with trainers. My ideal would be classic Adidas, black with the three white stripes. I, of course (stingy bugger than I am), wear cheap and nasty trainers that look vaguely like Adidas. If my wife bought me a pair of Reebok or Nike for Christmas no matter how expensive they were it wouldn’t be the same. She should probably go for a Marvel Select Hulkbuster. My treats were: From my (Great) Auntie Eva Horlicks sweets.. we were alllowed 2 each out of the tiny packet..I can taste them now, even though I can't have them! From my Nan, 2 things. The first a chunk of Frys cream....I bought a packet a few months ago, and cried as I ate one - to bastardise the lyrics of an Alarm song "Memories came flooding back..." Second? Currants...you read that right! Nan had jars of everything, I always chose currants as my twice weekly treat, and when we were baking, the rule "was one handful for the buns, one handful for you..." I'm holding back tears whilst typing!! Ah, M&Ms. :) Not so much a fan of the peanut ones, but like you they bring back childhood. I had a softhearted aunt who couldn't bear to see the birthday niece/nephew get all the gifts while the other 2 watched. So the non-birthday kids each received a one pound bag of M&Ms! Truth told, I think I enjoyed the other birthdays more than mine...because oddly the birthday boy/girl didn't get any. Now they make a dark chocolate version...hey, I don't drink or smoke, it's not the worst vice I could have. Thank you for making me smile.